Happy holidays everyone! 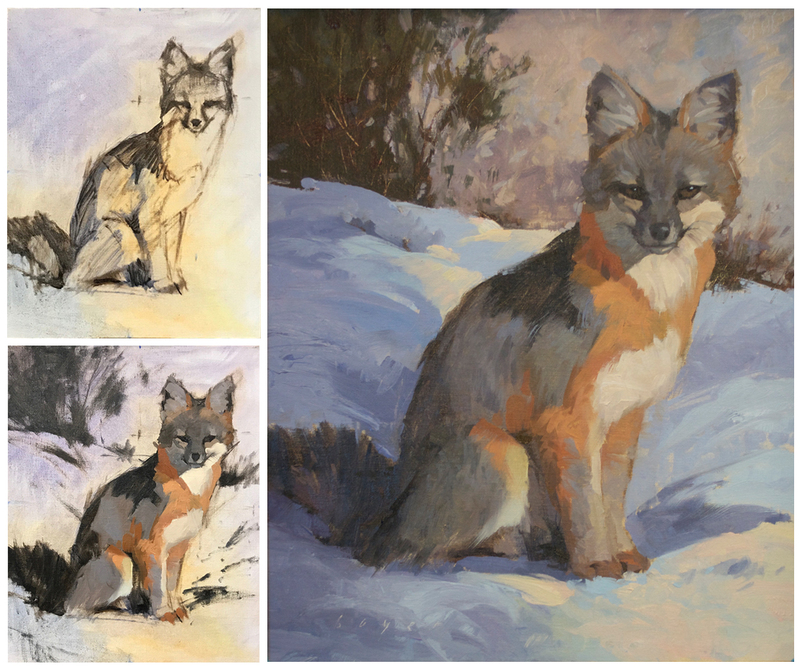 I got a request from someone to see a bit of the process on the painting of my fox friend that I completed at the gallery this week so here ’tis. Hope you enjoy the peek ‘under the hood’. A little background. If I do have to paint inside from one of my photos I have two criteria. First, is it something that carries personal memories for me and second, is it something I’ve come to understand through a lot of hours of observation. The fox family has lived under my deck for the past three years and they’ve become something of critter friends – from a polite distance. They’ll look in the window or nap in the sun on occasion a few yards away. One of the babies ended up tottering around under my legs while I had coffee one morning. Mom fox told me what she thought about that – which was not much. I knew I’d just been seriously told off in fox language. Though I secretly wish they’d come inside and hang out on the couch with me I’m careful not to encourage them. Don’t want them to become too comfortable with two-leggeds as sadly, not all are friendly – referring to the two-leggeds, not the foxes . Available at Sendero Gallery, Durango, CO.